Announced at Photokina 2008, the Sigma 24-70mm ƒ/2.8 was updated to include rounded diaphragm blades, an extra-low dispersion lens element, and most importantly, Sigma's HSM autofocus technology. The 24-70mm is a constant ƒ/2.8 lens, maintaining a constant aperture throughout its zoom range; however, the lens extends as it is zoomed towards 70mm. It is designed to fill the 35mm frame, and thus is compatible with full- and cropped-frame dSLR camera bodies. At the time of writing, the only mount that isn't supported is the four-thirds system. The Sigma 24-70mm ƒ/2.8 HSM ships with a petal-shaped lens hood, takes 82mm filters is currently available for approximately $900. The Sigma 24-70mm ƒ/2.8 is a decently sharp lens, especially when mounted on a cropped-frame dSLR body such as our Canon 20D. It loses its sharpness fairly quickly in the corners, especially obvious on a full-frame body. On the subframe 20D, the lens shows excellent sharpness at 35mm and wider at ƒ/2.8, with a generous sweet spot of sharpness (1-1.5 blur units) in the center of the frame which quickly devolves into some pronounced corner softness (4-5 blur units). Overall sharpness degrades towards 70mm, where we note better than average sharpness, about 3 blur units across the frame. Sharpness improves as the lens is stopped down, reaching excellent results by ƒ/5.6 - under 1.5 blur units across the frame at every focal length. At ƒ/8 we see minimal improvement, and while diffraction limiting sets in at ƒ/11, there's no practical drop-off in sharpness. At ƒ/16 we note a small loss in sharpness (1.5-2 blur units across the frame) and at ƒ/22 it's around 3 blur units across the frame. On the full-frame 5D, the true character of the lens is revealed. If you are looking for a lens that is corner-to-corner sharp when used wide open at ƒ/2.8, this is not the lens. True to what we noted in our tests with the 20D, central sharpness is still remarkable at 24mm and ƒ/2.8, but outside of this sweet spot sharpness falls off rapidly, reaching (and I think this is a record for us) 17 blur units in the top corners and 13 blur units in the bottom corners. Things improve a bit as the focal length is increased, at the expense of central sharpness. Stopping down to ƒ/4 and ƒ/5.6 improves results for sharpness dramatically, similarly to what we noted with the 20D, but corner softness is still noteworthy. At ƒ/5.6, corner softness starts to settle down at 35mm and longer. The optimal setting for sharpness seems to be 35mm and ƒ/8, where central sharpness is just over 1 blur unit, and just over 1.5 blur units in the corners. Similarly to the 20D, diffraction limiting sets in at ƒ/11, but the actual effect on image quality is minimal; even at ƒ/16, average image sharpness is approximately 2 blur units from corner to corner. At ƒ/22, it's 3 blur units across the frame. As a brief aside, this lens shows us an excellent example of ''what a blur unit looks like'' (which many of you have been asking for). 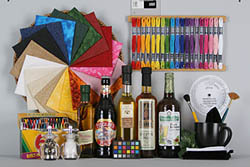 Even in the extreme corners, off the charts in terms of sharpness, when examined in the sample images, show that the while the corners are indeed soft, there is still detail to be shown. It's also worth noting that while the lens shows significant corner softness, it's restricted to the corners, and it's uniform in character, making the lens an excellent choice for isolating subjects. Not only is corner softness an issue with this lens, but chromatic aberration is particularly prevalent in the corners as well - though this is really more of a factor with the lens mounted on the full-frame 5D than the 20D. On the 20D, CA is actually quite well controlled, no doubt because the image sensor cannot see the extreme corners of the lens. But on the 5D, with the lens used at its widest aperture (ƒ/2.8), maximum chromatic aberration in our testing shows 18.75/100ths of a percent of frame height; at ƒ/22, we note 19/100ths of a percent. We like to see numbers below the range of 6/100ths of a percent of frame height. Examining the sample images, we do indeed note some significant blue fringing in areas of high contrast, but only in the corners; in the center of the image, CA isn't really an issue on either camera. Light falloff isn't an issue with the 20D, where the lens shows corners that are less than a quarter-stop darker than the center at any aperture and focal length combination. 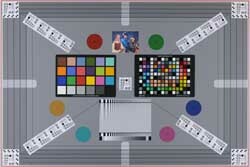 When used on the 5D however, we have another situation where the corners are again off the charts. In this case, the extreme situations are wide angle (24mm) and telephoto (70mm) at ƒ/2.8; in both cases the corners are 1.5 stops darker than the center. As per usual, this corner shading reduces as the lens is stopped down, and at ƒ/5.6 and smaller things begin to level off. There's always a small amount of corner shading, but it's less than a half-stop. It's worth noting that our analyzing software is measuring the darkest point (which is usually the extreme corner point) so the ''average'' amount of corner shading will be less than these numbers show, though in this case, it's still easily visible. Our testing for distortion shows a complicated pattern with a point of near-zero distortion. Used wider than 35mm, we note some typical barrel distortion, fairly minor in the center segment of the image (+0.3% on the 20D, +0.5% on the 5D) and also not too much in the corners (+0.5% on the 20D, +0.8% on the 5D). At 35mm it's still slightly barrel-distorted, but quite near to zero. Above 35mm central distortion stays in the realm of barrel distortion, but quite low, while corner distortion becomes the pincushion variety (-0.3% on the 20D, and -0.5% on the 5D). All in all, these aren't large numbers, and correctable in post-processing software. 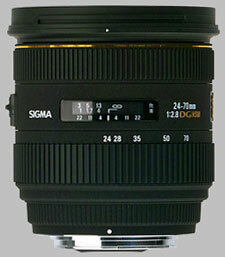 The Sigma 24-70mm ƒ/2.8 HSM takes about 1 second to focus from infinity to close-focus, about average for a lens of this type. It focuses nearly silently and short focus throws happen very quickly. Autofocus results can be overridden by simply turning the focusing ring. While the previous version of the 24-70mm ƒ/2.8 bore a macro designation, this version has had its macro capability reduced. Its magnification ratio is only 0.19x, with a minimum close-focusing distance of 38cm (around 15 inches). The 24-70mm ƒ/2.8 HSM bears all the standard trappings of Sigma's line of HSM lenses; heavy-duty plastic construction, with a dark grey rubberized coating. The lens is heavier than it looks (closing in on two pounds), somewhat front heavy when mounted on smaller cameras. The lens mount is metal, and the large 82mm filter ring uses a plastic thread. The lens offers a distance scale covered by a window, showing distance information in feet and meters. A depth of field scale is present with marked apertures for ƒ/4, ƒ/11 and ƒ/22. There is no infrared index mark. The only control feature other than the zoom and focus rings is a selector switch, which enables or disables autofocus. The zoom ring is the larger of the two, rubber with a deep ribbing running parallel to the lens body. The ring is 3/4'' wide and takes only about thirty degrees to zoom through its range of focal lengths. There is some lens extension as the lens is zoomed towards 70mm, adding an addition 1 1/8'' to the lens' overall length (3 3/8''). Zoom creep is not a factor with this lens, and accordingly, there is no zoom lock. The focus ring is thinner than the zoom ring, located near the front of the lens, 1/2'' wide. It uses the same rubber with ribs design as the zoom ring, using soft stops to indicate the infinity and close-focus ends of the focus spectrum. The lens will focus slightly past infinity. The lens uses internal focusing, so there is no lens extension during focusing, and the front element does not rotate. The petal-shaped lens hood reverses onto the front of the lens for easy storage. The lens hood is matte on the interior, using a ribbed texture to reduce the amount of light striking the front element of the lens. The hood is 2'' long, adding 1.5'' to the length of the lens when it is in use. Canon's 24-70mm design is fairly venerable, but revered by all who own a copy. The Canon is unquestionably sharper than the Sigma below 70mm and at apertures below ƒ/8, though at 70mm the Canon is somewhat soft. At ƒ/8, they're about on par. Results for CA, distortion and corner shading all favor the Canon, though you pay for that performance, significantly more than for the Sigma. Perhaps the sharpest of the 24-70mm in this comparison, the Sigma doesn't match the sharpness of the Nikkor at any focal length or aperture setting. Chromatic aberration is also better with the Nikon (even more so when used on a D3/D300 with automatic chromatic aberration reduction); corner shading is also less of a factor. The Nikon distorts slightly more at 24mm. Like the Canon, you pay more for this performance, and in this case, much more, owing to the relative novelty of the design. Pentax doesn't offer a full-frame body, so this lens provides a 24-75mm focal length when considering the crop factor of Pentax bodies (1.5x). We haven't yet tested this lens. The Sony 24-70mm is an excellent design, sharper than the Sigma at most aperture / focal length combinations (though perhaps on par at the 70mm range). Chromatic aberration resistance is better, though it's similar in the distortion and corner shading tests. Tamron's 28-75mm ƒ/2.8 is a similar inexpensive way to get the similar focal length / aperture range offered by the Sigma. In our tests it did very well, offering the same sharp central performance and perhaps more forgiving corners. Chromatic aberration resistance is excellent, aided by the 28mm rather than 24mm wide angle. Distortion and Corner shading performance is similar to the Sigma. Depending on what you're looking for, the Sigma 24-70mm ƒ/2.8 is a good lens - especially if you're looking to save money. While it doesn't provide the same corner-to-corner sharpness wide open (and even stopped down, to some degree), it performs extremely well on sub-frame cameras, though the resulting effective focal length is of questionable usefulness (38-112mm Canon, 36-105mm others). So, the lens has its issues when used wide open: pronounced corner softness and chromatic aberration in the corners, as well as intense corner shading. If you'll be using this lens stopped down, these issues are less of a concern, but if you need excellent performance in any of these areas at ƒ/2.8, you may want to invest in more expensive glass. Good interesting pattern for portraits. Fast and accurate autofocus. Lovely color. Excellent sharpness. I purchase it for shooting Nikon D750. Its main advantage - an artistic image. At aperture 2.8 a little blurred, but with preservation of thin figure - sets the mood in the frame. A 5.6 sharp across the field, competing with the leading companies in the class 24-70mm f / 2.8, keeping the interesting character of light. Great color, better than the Nikon 24-70mm f / 2.8. Good bokeh for this class. Work Sigma 24-70mm f / 2.8 EX DG HSM brings me great pleasure. Great lens. Unbelievable fast focusing. A lot faster than the Nikon 28-70 2.8. Sharper than the Nikon 28-70 2.8 at 28mm, comparible at 70mm. IQ is great. Using a Nikon D300 gave no problems or whatsoever in close up range as reported by others. All in all a very impressive lens ! I bought this lens several months ago because I need a wide zoom lens for my full frame DSLr camera, Nikon D700. Previously I use Nikkor 24mm f/2.8 and Nikkor 35mm f/2.8, but I feel I switching lenses all the time is quite cumbersome for type of photography I like to do, event photography. This lens is regarded as high-end lens, the one usually used by serious photographers such as professionals and advanced amateur photographers. Nikon does not have many lens optimized for full frame camera. Nikon does offers Nikon 24-70mm AF-S f/2.8, but it is simply too expensive considering I am not full time photographer. * Size: It is compact, but the diameter is big. It takes 82mm filter. * Focal Length: 24mm is quite wide for many purpose although if you primarily take ultra-wide angle, consider Nikon 17-35mm or 14-24mm. 70mm is decent range, not too long and not too short. * Auto Focus: Quiet and fast, tracks well thanks to HSM (hypersonic motor). Despite all of above, there are couple things that I personally do not like: Sometimes, the auto focus switch automatically switch to manual focus. Until now, I don't know what trigger it. Although I like the compact size (short), but I feel the lens is not as comfortable to hold as the thinner, 77mm lens. I highly recommend this lens for anybody who love "affordable" high quality lens. The lens works very well in full frame DSLR cameras, but it also works great in crop sensor camera. You can get a lot of value out of this lens even though you have crop sensor camera. The only difference of mounting the lens on crop sensor camera will be the focal length. In crop sensor camera, it is equivalent to around 35-105mm. It might not wide enough in tight space, but looking at the positive side, you gain 35mm of extra focal length, which is great for head and shoulder portrait. I'm using this lens on a 5D2 and I find it to be pretty sharp at f2.8 and seriously sharp from f4 on. I've not noticed any CA or purple fringing with this lens so far and the distortion at 24mm seems minimal. The only thing that lets this lens down is the vignetting on a 135 frame is pretty bad and does not really disappear at 24mm. This is however really easy to remove when processing your RAW. my copy is not particularly good at min focus distance and I did have to dial in focus microadjust to stop it front focusing. (it also did this on my 20D & 40D so I'll be sending it for recalibration soon). filter thread not a problem since 82mm hoya CP's are pretty cheap from HK. I got this lens (Nikon mount) in HK last week and took a number of shots on Sunday. Pros : No front-focus issue was found. AF is very fast and resolution throughout the range is high. The IQ is aharp and better than my Nikon16-85mm and Sigma 18-50mm EX f/2.8 lens. Colour rendition is excellent. Cons. : The filter is expensive for 82mm which costs me US$118 for B+W. The wide angle is not enough for indoor shot with my Nikon D90. It also feels a bit heavy compared with 16-85mm. VR is not included. Conclusion : This is a very sharp and high-resolution lens. It will be prefert with VR function. The filter size is 82mm which requires approx $200 for a circular polarizer, or more depending on which brand you buy! So adding the $899 + $260 I spent on a Hoya HMC, I can just take it back and exchange it for the Canon 24-70L for the same amount! Since I already own an L lens that has a 77mm filter, the net cost to me is nearly the same. This lens has great potential though. when I Live View focus the images were very sharp across most of the focal range... however, there was a fair amount of Chromatic Aberration to be found.